“What’s with the ‘mafia’ in that factory?”, I asked my companion. Or, rather, what I actually said was “Ce este cu ‘mafia’ la fabrica asta?”, necessarily exercising my newly-acquired broken Romanian in my first few months as a volunteer in Romania. This was May 1993. My companion in the train compartment was my landlady, who had kindly accompanied me on a train journey from Siret, in the far north of Romania, to Focsani, 300 kilometres south, to what I had been told was “The best factory for BCA building blocks in Romania”. We were now on the return journey. Raluca, Alina and Ramona, l to r, with Ancuta behind. 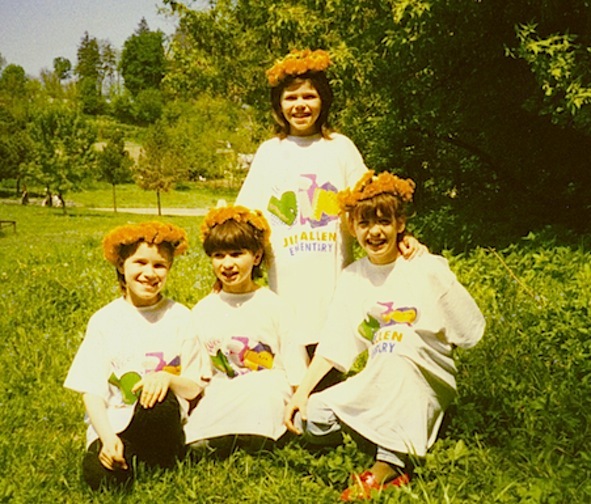 Four of the ‘Bunnies’, my delightful special needs class from School no.11, Suceava, in 1994. They are wearing dandelion coronets we made on the day, and T-shirts from a special needs school in Pensacola, Florida, with which the Bunnies did an email project (despite the headmaster’s attitude which was that I was wasting my time trying to do such a thing with them. He had to eat his words, but more of that in a future post about the delights of teaching English in Romania). Oh, I’d almost forgotten the mafia. “The word you were hearing, was ‘marfa’ not mafia”, Felicia chided me. “They were talking about the product you wanted – ‘marfa’ is Romanian for ‘produce’. “Mind you, you almost certainly encountered a mafia”, she added with another wry smile. I just love where blogging takes me and I was surprised to learn that Eddy’s story has so many things in common with mine, including being lured into teaching English. My own wanderings into strawbale building will have to wait for a future post.